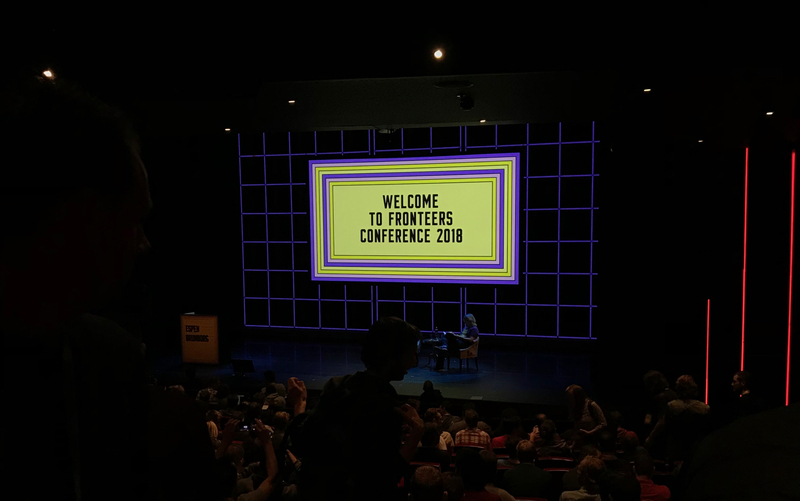 Last week was the Fronteers Conference 2018 in Amsterdam. I have actually never visited this conference before and there was a stellar line-up, so I was super excited to go. I was amazed by the quality of talks but because discussing 16 talks in this blog is a bit much, I’ve selected a couple of my favorites. The event began with a pre-party on the night before the conference. This was actually the last time FrontCheers organizers Charis and Peter held this pre-party, so it was nice to be a part of this final moment. The day started with coffee and cookies! This year’s conference took place in a new location, the DeLaMar theatre. I wasn’t at the previous conferences so I don’t have anything to compare, but I liked the comfortable seats of the theatre! 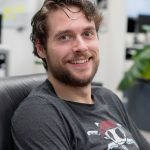 Espen Brunborg started the conference with his talk “The Secret life of Comedy“, which was a great talk about how we as web developers and designers tend to automate our processes. It has never been easier to make an online product, be it an application, a blog, a website or an online store. Espen wonders if there is – while we’re obsessed with automation – still room for beauty, expression, and art. Super fun talk to start the day, good presentation as well. Another talk that caught my attention was that of Chiara Aliotta. Chiara talked about how designers and developers are capable of controlling how a user uses our products, both physical and emotional. Because of this, we need to carefully consider how to use this responsibility. With persuasive design, we can improve a user’s journey and get them to trust us without using devious tricks and deceiving them. The talk was great, and watching her beautiful accompanying slides was a delight. After lunch (which was awesome) Chris Gannon took the stage. I have to give a big compliment to the organizers for programming Chris after lunch. His energy and humor were a very good medicine against bodies processing big amounts of food. Chris showed us loads of awesome examples of his work and creative experiments. After having a German Schnitzel and an hour of chilling at the hotel, the evening program kicked off. The main program consisted of a series of 10-minute talks called the Jam Sessions. There was also a dedicated space (without music) to talk to – and drink with – other conference visitors. The Jam Sessions were fun and informal talks and what a cool idea to also offer an evening program for people in town anyway. The only downside was the sound level during the talks, which made some people harder to follow. After lunch (the meatloaf was amazing!!) Ruth John took the stage. This talk sparked my interest because it kind of relates to my chiptune music and the coding scene related to that. Ruth took us on an audiovisual journey by using realtime data like her microphone. She explained how to utilize the Web Audio API to create audio visualizations in our browsers. It was also fun to see her mention the collective (live:js) she’s part of, and actually meeting a familiar name from the chiptune scene. It was an energetic fun talk. The last talk I want to discuss is “How to Crash an Airplane” by Nickolas Means. I’m always impressed by speakers who manage to captivate the audience in such a way that everyone’s all ears. Nickolas took us through an airplane disaster from the 90s, where against all odds, the plane managed to land safely (keeping casualties relatively low). This couldn’t have happened if the crew didn’t work together as a team. A couple of things I learned from this were: don’t solely rely on a hero, let the entire team have a say in matters, and trust each other. It was an amazing talk and also the way of talking. 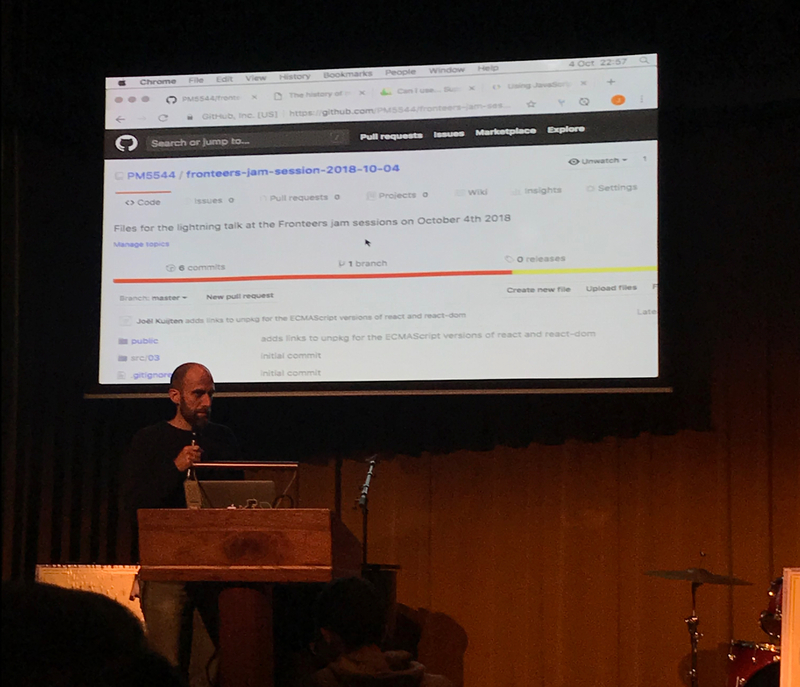 The conference was also a good location to talk to other Fronteers members. The Slack group has an app installed (Donut) that matches members that are in a #meetandgreet channel. The purpose of this is just to sit down and have an informal chat to get to know each other. Because most people don’t live around the corner, meeting while being at the same conference is convenient. The conference felt very well organized, with nice coffee, well-arranged lunch, enough volunteers, a nice location and awesome line-up. For those of you that read this and had to miss this great conference, the early bird tickets for the Spring conference are online! Going to this conference three weeks before our own design & front-end conference was a good opportunity to learn and see for ourselves how a similar conference arranges their things. We went home with a lot of inspiration and can’t wait to welcome our speakers and guests.